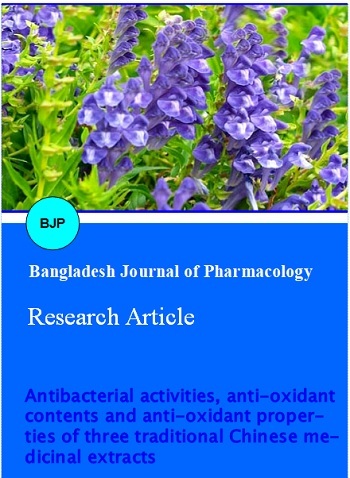 The present study was carried out to identify antibacterial and antioxidant characteristics of traditional aqueous extracts derived from three traditional Chinese medicinal plants (Scutellaria baicalensis, Coptis chinensis and Sonchus oleraceus). It was indicated that the S. oleraceus showed the highest antibacterial efficacy, especially against Staphylococcus aureus. The minimum inhibitory concentration (MIC) of the S. oleraceus was 5.0 mg/mL what was in correlation with the high total phenolic and flavonoid contents and CUPRAC value, and MIC of both S. baicalensis and C. chinensis was 7.5 mg/mL. The rational pH of the working S. oleraceus was acidic, while the other two preferred to neutral or alkaline environment. The reasonable preservation temperature of S. baicalensis should not beyond 60°C, while the other two below 90°C. Meanwhile, S. baicalensis had significant antioxidant activity with the highest CUPRAC and ·OH scavenging activity. These results had provided useful information on further drug discovery. Abu Bakar MF, Mohamed M, Rahmat A, Fry J. Phytochemicals and antioxidant activity of different parts of bambangan (Mangifera pajang) and tarap (Artocarpus odoratissimus). Food Chem. 2009; 113: 479-83. Apak R, Güclü K, Özyürek M, Celik SE. Mechanism of antioxidant capacity assays and the CUPRAC (cupric ion reducing antioxidant capacity) assay. Microchim Acta. 2008; 160: 41319. Bakirel T, Bakirel U, Kele? OU, Ulgen SG, Yardibi H. In vivo assessment of antidiabetic and antioxidant activities of rosemary (Rosmarinus officinalis) in alloxan-diabetic rabbits. J Ethnopharmacol. 2008; 116: 64-73. Buchmann K, Roepstorff A, Waller PJ. Experimental selection of mebendazole resistant gill monogeneans from the European eel, Anguilla anguilla. L. J Fish Dis. 1992; 15: 393400. Celik SE, Özyurek M, Güclü K, Apak R. Solvent effects on the antioxidant capacity of lipophilic and hydrophilic antioxidants measured by CUPRAC, ABTS/persulphate and FRAP methods. Talanta. 2010; 81: 1300-09. Ceylan E, Fung DYC. Antimicrobial activity of spices. J Rapid Meth Aut Mic. 2004; 12: 155. Duffy CF, Power RF. Antioxidant and antimicrobial properties of some Chinese plant extracts. Int J Antimicrob Ag. 2001; 17: 52729. Fu R, Zhang YT, Guo YR, Liu FX, Chen F. Determination of phenolic contents and antioxidant activities of extracts of Jatropha curcas L. seed shell, a by-product, a new source of natural antioxidant. Indian Crop Prod. 2014; 58: 26570. Irshaid FI, Tarawneh KA, Jacob JH, Alshdefat AM. Phenol content, antioxidant capacity and antibacterial activity of methanolic extracts derived from four Jordanian medicinal plants. Pakistan J Biol Sci. 2014; 17: 372-79. Katalinic V, Milos M, Kulisic T, Jukic M. Screening of 70 medicinal plant extracts for antioxidant capacity and total phenols. Food Chem. 2006; 94: 550-57. Khaled-Khodja N, Boulekbache-Makhlouf L, Madani K. Phytochemical screening of antioxidant and antibacterial activities of methanolic extracts of some Lamiaceae. Indian Crop Prod. 2014; 61: 4148. Li BB, Smith AB, Hossain MM. Extraction of phenolics from citrus peels: II. Enzyme-assisted extraction method. Sep Purif Technol. 2006; 48: 189-96. Li?ina BZ, Stefanovi? OD, Vasi? SM. Biological activities of the extracts from wild growing Origanum vulgare L. Food Control. 2013; 33: 498-504. Liu QF, Luyten W, Pellens K, Wang YM, Wang W, Thevissen K, et al. Antifungal activity in plants from Chinese traditional and folk medicine. J Ethnopharmacol. 2012; 143: 77278. Lopez P, Sanchez C, Batlle R, Nerin C. Solid- and vapor-phase antimicrobial activities of six essential oils: Susceptibility of selected foodborne bacterial and fungal strains. J Agr Food Chem. 2005; 53: 6939-46. Padam BS, Tin HS, Chye FY, Abdullah MI. Antibacterial and antioxidative activities of the various solvent extracts of banana (Musa paradisiaca cv. Mysore) inflorescences. J Biol Sci. 2012; 12: 62-73. Park YS, Jung S, Kang SG, Delgado-Licon E, Katrich E, Tashma Z, et al. Effect of ethylene treatment on kiwifruit bioactivity. Plant Food Hum Nutr. 2006; 61: 151-56. Petlevski R, Flajs D, Kalodera Z, Koncic MZ. Composition and antioxidant activity of aqueous and ethanolic Pelargonium radula extracts. S Afr J Bot. 2013; 85: 1722. Rubio-Moraga Á, Argandoña J, Mota B, Perez J, Verde A, Fajardo J, et al. Screening for polyphenols, antioxidant and antimicrobial activities of extracts from eleven Helianthemum taxa (Cistaceae) used in folk medicine in south-eastern Spain. J Ethnopharmacol. 2013; 148: 28796. Schinella GR, Tournier HA, Prieto JM, de Buschiazzo PM, Rios JL. Antioxidant activity of anti-flammatory plant extracts. Life Sci. 2002; 70: 1023-33. Smirnoff N, Cumbes QJ. Hydroxyl radical scavenging activity of compatible solutes. Phytochemistry 1989; 28: 1057-60. Sun HY, Li ZB, Liu WX, Zhang TJ, Fen ZJ. In vitro antibacterial activities of antibiotics and traditional Chinese medicinal herb extracts on Escherichia coli and Staphylococcus aureus. Asian J Chem. 2014; 26: 298-302. Taguri T, Tanaka T, Kouno I. Antibacterial spectrum of plant polyphenols and extracts depending upon hydroxyphenyl structure. Biol Pharm Bull. 2006; 29: 2226-35. Terpinc P, ?eh B, Ulrih NP, Abramovi? H. Studies of the correlation between antioxidant properties and the total phenolic content of different oil cake extracts. Indian Crop Prod. 2012; 39: 21017. Wong CC, Li HB, Cheng KW, Chen F. A systematic survey of antioxidant activity of 30 Chinese medicinal plants using the ferric reducing antioxidant power assay. Food Chem. 2006; 97: 70511. Yildirim A, Mavi A, Kara AA. Determination of antioxidant and antimicrobial activities of Rumex crispus L. extracts. J Agric Food Chem. 2001; 49: 4083-89. Zhang L, Ravipati AS, Koyyalamudi SR. Anti-fungal and anti-bacterial activities of ethanol extracts of selected traditional Chinese medicinal herbs. Asian Pac J Trop Med. 2013; 6: 673-81. Zhang C, Su JH. Application of near infrared spectroscopy to the analysis and fast quality assessment of traditional Chinese medicinal products. Acta Pharmaceut Sin B. 2014; 4: 18292.